Although I read mostly fiction, I do listen to non-fiction audiobooks during my commute. For some reason, I find a true story keeps my attention, while also allowing me to follow the rules of the road. I gravitate towards narrative non-fiction about medicine, psychology/human behavior, books about books, or riveting personal memoirs. Recent non-fiction books I’ve enjoyed include Educated by Tara Westover, Edna’s Gift by Susan Rudnick, The Four Tendencies by Gretchen Rubin, and I’d Rather Be Reading by Anne Bogel. 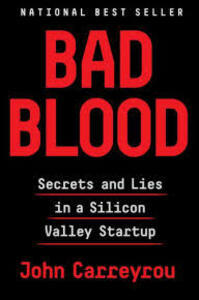 When I heard about Bad Blood: Secrets and Lies in a Silicon Valley Startup, I knew it had to be my next non-fiction pick. A book about medicine which also includes intrigue, deception, and double crossing? Yes, please. Bad Blood is an exploration of the downfall of Theranos, a Silicon Valley startup, and its magnetic young founder, Elizabeth Holmes. Dropping out of Stanford to launch the company, her idea was to market a portable blood testing machine that could perform hundreds of diagnostic tests on a single drop of blood. Convinced her idea would revolutionize medicine, Holmes would stop at nothing to make sure she and her company rose to stardom. She raised billions of dollars from major investors and lured heavy hitters to sit on the board—including Henry Kissinger, James Mattis and George Shultz—but behind the fast-talking salesmanship, the company was a hot mess. Almost none of Holmes’ claims about Theranos’ innovative blood testing technology were true, the company’s organizational systems and leadership were chaotic, and the work environment was poisonous. The reader is allowed a peek through the opaque windows of the secretive company to understand why it had such a meteoric rise and horrendous fall. The book is an expansion of a piece Carreyrou published about the company in the Wall Street Journal in 2015. He spent hours interviewing former employees of the company and combing through documents in order to expose the fraud going on behind Theranos’ well-guarded doors. It was his tireless efforts that eventually led to the downfall of the company and the subsequent civil and criminal litigation against Holmes and her former boyfriend and business partner, Sunny Balwani. Carreyrou did an incredible job synthesizing all of the collected information into a compulsively readable page-turner of a book, and Will Damron did a masterful job with the audio narration. And the cherry on top—Bad Blood will soon be a feature film, starring Jennifer Lawrence as Elizabeth Holmes. I will definitely be buying tickets to see how this unbelievable story transfers to the big screen.